Cobblers boss Dean Austin will be urging his players to get out of the blocks and attack rock-bottom Notts County on Saturday. It’s fair to say the Magpies are in a vulnerable state at the moment, having conceded a mind-boggling 24 goals in their past seven league games. They have let in three or more goals in every league two game they have played this season, excluding the opening day 0-0 draw with Colchester United. Their dismal start led to manager Kevin Nolan being sacked, but his predecessor Harry Kewell has struggled to stem the tide, with the team shipping eight goals in his two games at the helm, the first a 5-1 pasting at Exeter City. County led three times in their most recent outing against Stevenage, before drawing the Meadow Lane clash 3-3, which did at least mean they picked up only their second point of the campaign. But to say they have a weakness in defence is an understatement and the Cobblers will be urged to go for the jugular at the PTS Academy Stadium this weekend, although Austin insists that is always the plan anyway. “It’s what we work on, and we are always trying to be on the front foot,” said the Town boss, if he would be setting his team up to make a quick start. “If we aren’t on the front foot, it’s because another team has come at us and got themselves on the front foot. But that is the way we are, it’s the way we are made, it’s the way I want us to be. “Because we are not winning as much as we want, I am certainly not going to change the style as in regards to trying to go forward, trying to create chances, trying to pass the ball and trying to score goals. Austin will come up against somebody he knows well, and respects, in Kewell. The former Leeds United, Liverpool and Australia midfielder was the under-23s coach at Watford when Austin was at Vicarage Road as assistant boss. After a stint at Crawley Town, Kewell has found himself at County who, along with the Cobblers, will be viewed as a big fish in the league two pond, although neither team is living up to their pre-season hype at the moment. 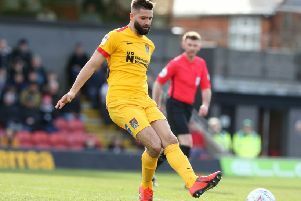 Austin is aware Kewell has problems to deal with at Meadow Lane, but all he is worried about this weekend is himself, and winning three points for the Cobblers. “Harry Kewell is somebody I know really well,” said Austin. “He is a smashing lad and a good coach, and he is just starting out on his reign at Notts County. “I have the utmost respect for Harry, he is a good lad, and it is going to be a tough game on Saturday, every game is a tough game.